Every decision essentially has three parts to it. 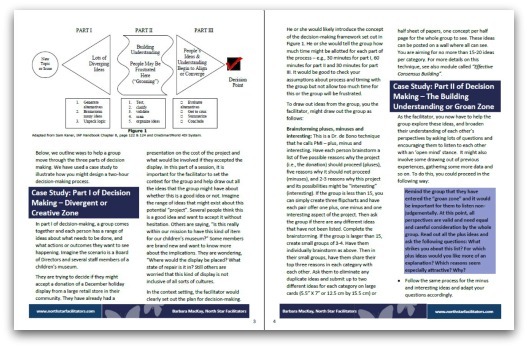 In this handout, we’ll learn what these three parts are and describe the overall process of decision-making and offer a framework to describe and understand the process based on Sam Kaner et al’s work and the OneSmartWorld system. 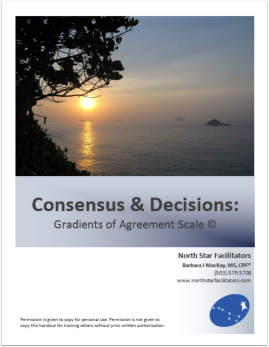 We also offer a modified version of Kaner’s decision-making “gradients of agreement” scale (a facilitator’s tool!) which can be used to help a group decide what levels of agreement they are having for important decisions that need to be made by larger group.